MANILA, Philippines - (Updated 5/28/2018) The May 2018 Certified Public Accountant (CPA) board exam top 10 or topnotchers including other results - list of passers, top performing schools and performance of schools are released online on Monday, May 28 or in five (5) working days after the last day of exam. 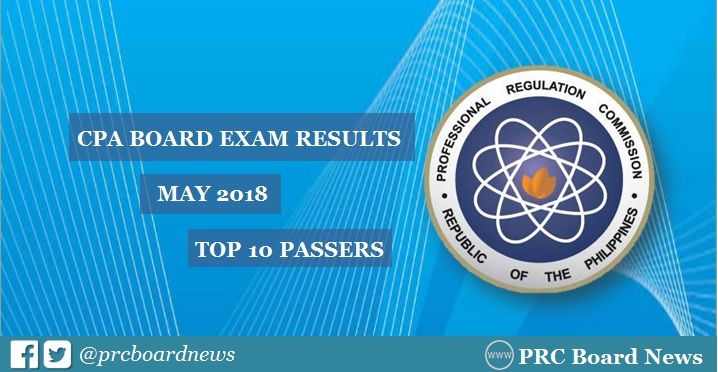 The Professional Regulation Commission (PRC) administered the licensure exam on May 13, 20 and 21 in the cities of Manila, Baguio, Cagayan de Oro, Cebu, Davao, Iloilo, Legaspi and Tacloban. Jayson Ong Chan from Saint Paul School of Professional Studies (SPSPS)- Palo topped the board exam with 92.50%. It was followed by another SPSPS - Palo alum Jomari Jess Sacendoncillo Abellar with 91.67%. In the same period last year, Vianca Pearl Inot Amores and Marianito Jesus Berdin Del Rio both from University of San Carlos (USC) aced the board with 92.67%. Jessa Comar Bermudo, also from USC, ranked second with 92.50%. Meanwhile, Karim Gonzales Abitago from Universal Colleges of Parañaque (UCP) topped the May 2016 CPA board with 92.17%. Cor Jesu College alumnus Kimjames Sarapanan Manalo was on second spot with 91.83%. According to PRC Resolution No. 2017-1068, the target release of results of the recent CPA board exam is on Friday, May 25 or in four (4) working days after the test. We advise takers to monitor announcement of results starting Thursday or in 3 working days after the exam. Note that results may be released online ahead or beyond the schedule without prior notice. UPDATE: In a Facebook post on Thursday, PRC BoA shared a memorandum of the request of its Chairman, Joel Tan-Torres, to extend date of release of CPA board exam results from May 25 to May 28. "The Board is unanimously recommending the extension of the date of the results of May 2018 CPA board examination from May 25 to May 28," the memorandum addressed to PRC Commissioner Yolanda D. Reyes said. "This is to compensate for the extension of the period of the examinations (the last day was extended from May 20 to 21) and to provide more time for the new examiners (there were three new appointments) to learn the policy and procedures for the deliberation and release," the memo added.